As a recent graduate from UH Hilo and a native to Hale'iwa nei, Aulani struggled with figuring out what her next step would be in regards to her future. She had developed a special love for the deeply cultured and little country town of Hilo and hadn't planned on returning to the crazy and busy island of O'ahu. 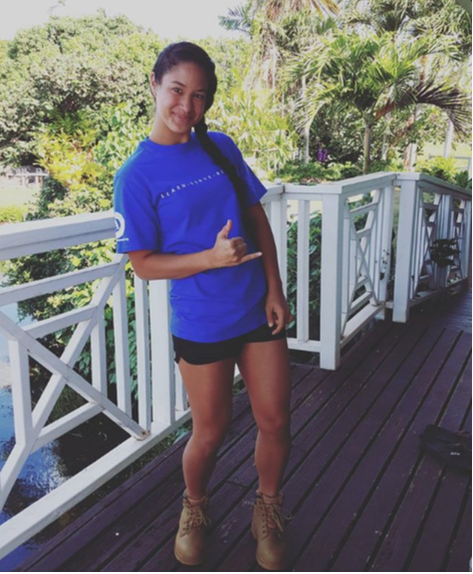 During the process of applying for the KUPU Extended Internship Program (EIP), Aulani planned on working in Hilo or in Moloka'i, leaving O'ahu her last choice. Sure enough, she got the position in Hale'iwa. Although it was tough at the moment, Aulani laughs now that she ended up back home. In the Hawaiian culture, the piko (umbilical cord) of the child is buried near their home, establishing a connection between the child and the 'aina. In her mother's words, "the child will return home." That's exactly what has happened. "Ua ho'i no au i ku'u one hanau," said Aulani. "I have returned to the sands of my birth." As a kama'aina to Hale'iwa, there are kuleana that need to be fulfilled. Malama 'aina is a huge in Aulani's daily life and what better way than to care for her homeland.